Today I want to show you how timer overflow interrupt works. All the timers in Arduino microcontroller – and in every microcontrollers – are a simple counters. These counters are increased – usually – by the main clock of the microcontroller. Every time we have a clock cycle – the time between two adjacent pulses of the main oscillator – the counter increases according to the prescaler set for those timer. The prescaler is used to reduce a high frequency counter to a lower frequency by integer division. The prescaler takes the basic timer clock frequency and divides it by some value before feeding it to the timer. This means that you can reduce the frequency of the timer. Well, when the timer counter reaches its maximum value in bit – means that if the timer is a 8-bit timer, it can reaches maximum 255 – the timer go back to zero. At this specific moment, the timer overflow interrupt occur. This means that we can do something at the frequency that we want. We want to blink a LED at the frequency of 50 Hz. What do we need to do? 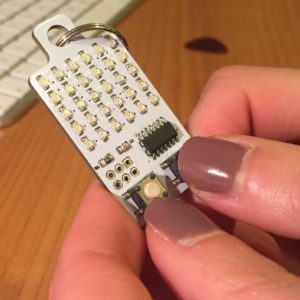 Well, the frequency of the microcontroller – for example the Attiny84 used in KeyChainino – is 8 Mhz. We suppose to use the Timer1. To decrease the frequency we need to use a prescaler. So take a look on the Datasheet of this specific microcontroller. You can see that the Timer 1 – called Timer/Counter 1 – can be set by the TCCR1B register. It this specific case, Timer 1 is a 16 bit timer, this means that the maximum timer value is 65536. “The bits 2:0 select the clock source to be used by the Timer/Counter”. Good, It is our prescaler! We can manipulate these bits to set a different prescaler. Because we want 50 Hz timer frequency, we need to set the prescaler so that main clock frequecy – 8 Mhz (8.000.000 Hz) – is reduced to a small value. The resulting frequency is too high for our 50 Hz. We need to further reduce the frequency. How? But we need to set the TCNT1 register to 65380 every overflows. This timer overflow interrupt is used on KeyChainino, with higher frequency, to update the Charlieplexing Matrix.